If you ask around most people will suggest that you start off with a veiled chameleon as your top choice, or a panther as a close second. The benefits veileds have over other species is that they are easily available as captive bred, are hardy, and are very affordable (anywhere from $20-60 for a 2-3 month old baby). Panthers are also hardy but require more humidity, and usually sell for $200 and up for a baby the same age, so they are considerably more expensive. Othello, my Jackson's chameleon male. But not everyone likes or wants to start off with the same species as everyone else. I think it's not necessary to scare capable new keepers away from other less popular species, especially since there are many others that are not any more complicated to keep. It's your pet, you should be able to choose the one you like the most. I just urge any new keepers to be realistic with themselves about what it is they can provide for a new pet like a chameleon, and ask if they can and are willing to meet the needs of their species of choice. Buy books, search online, ask breeders and get an idea of what this species requires, and see if you can meet those requirements. When I began I did not like the look of male veileds and I did not have $250 to pay for a panther, so I wanted something else. I found Jackson's chameleons and thought they were perfect. They sold for under $100, were a pretty green, and had three horns like a Triceratops. I was completely sold! But people from forums told me to stick to a veiled, that I wasn't going to be able to handle this "difficult" species as a beginner. I bought one anyway and he did absolutely great. I understood that they needed everything a little cooler (so between the AC and his lower wattage basking bulb, I was fine), needed fewer supplements, and that they loved lots of water (nothing I couldn't provide with a water pump.) He did great for years until I gave him to a new home due to space concerns. I thought he was a very sweet individual and he made a fantastic first chameleon. So when considering which species of chameleon to start off with, do lots of research and get lots of opinions. And then decide for yourself which is going to be the best match for what you want and for what you can provide. *TIP: Choose ONLY captive bred chameleons over wild caught chameleons. They will be less likely to carry parasites, have problems acclimating to your home, and be overall more healthy. Hi Olimpia! I have been reading a lot of the info on the blog- we are researching for our first chameleon. My son is 13 (a mature 13) and he has three green tree pythons so he is familiar with a harder to keep species so to speak. I was glad to see your list above includes Carpet chameleons. We are really interested in them but also maybe in the panthers. He is not a fan of the look of the veileds and he does like the Jacksons but I am not a big fan of those. Any advice you have in your experience for a first chameleon for us? Between a panther and a carpet? I have been in contact with someone who has carpets available (CB) and we are going to the Daytona Expo next Saturday so will probably see plenty of CB panthers there. Just not sure what to do. Hey, I apologize for the delay! I think a carpet can be a phenomenal first chameleon, they are small, very hardy when you start off with a healthy animal, and their care is nearly identical to that of a panther, except that they need less space. I have had and love both species, but I'm personally more of a fan of larger chameleon species so it may come down to your own preference. I know a lot of other people who are the opposite, they like small chameleons because they take up less space. The only negative might be their shorter life-spans, since panthers average a life of 5-8 years while carpets live more like 2-3. If you want to go in the direction of carpet chameleons I highly recommend that you contact Kevin Stanford at kevin.j.stanford@gmail.com, he is a carpet breeding guru and has more success with them than anyone else I know. I know that just yesterday some babies hatched and that he has older boys ready to go to new homes, so he would be a great person to get one from soon. I've gotten mine from him and they are always healthy and beautiful. Good luck with whatever you choose! Both are great, and neither is really harder to care for than the other. Funny!! I have actually been messaging him for awhile on FB for a few weeks now!! You are right- he does have some older males ready to go now-- Thanks!! All material, unless otherwise cited, is copyright to Olimpia Martinotti. Powered by Blogger. 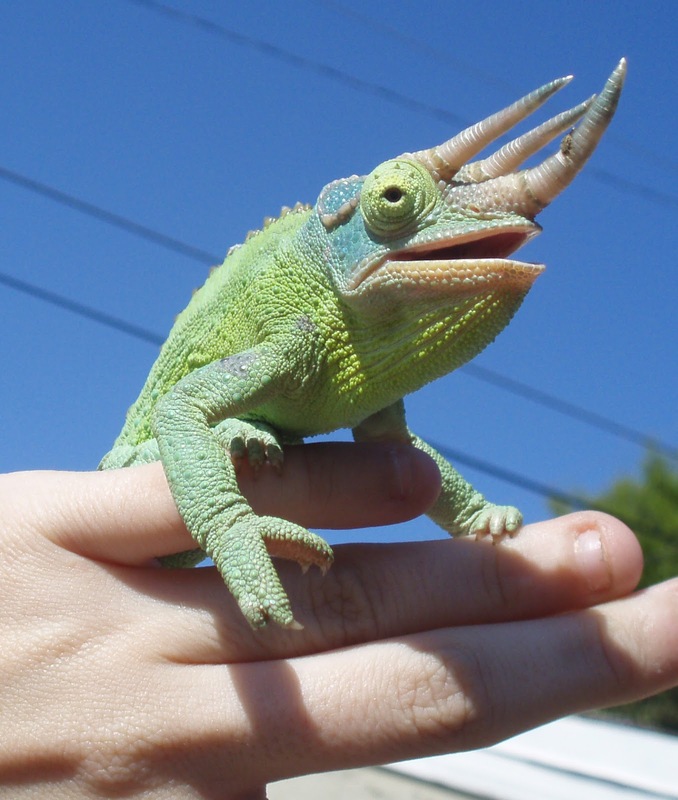 In 2008 I bought my first chameleon. Nine years later, I still can’t stop talking about them and helping people become confident, capable chameleon owners. I'm Olimpia Martinotti - Follow along to learn about the care, breeding, and rehabilitation of chameleons in captivity through a biologist with almost two decades of exotic animal experience. Appreciate the information on Much Ado About Chameleons? Consider leaving a tip! Tips go directly towards supporting the blog and its high-quality content. Readers’ tips were able to send me to an expedition to Madagascar in Feb 2017, hosted by Chameleon Education & Outreach, Inc., which was an incredibly valuable experience. © 2017 Much Ado About Chameleons. Heyden Template designed by Georgia Lou Studios. All rights reserved.